Only 16 percent of homebuyers using Redfin faced a bidding war during the first weeks of this month, the online brokerage reported Wednesday, a dramatic fall from a year ago when nearly two thirds of buyers were competing against other offers. 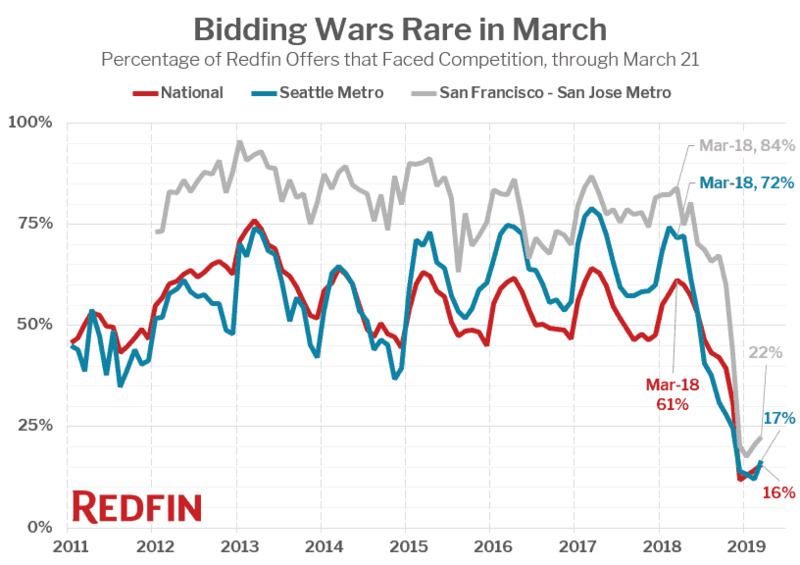 Redfin’s report shows that the number of the brokerage’s homebuyers facing a bidding war ticked up slightly since hitting a record low of 12 percent in December, but is still down significantly from the first weeks of March 2018, when 61 percent of buyers how to outbid competitors. And despite the uptick, bidding wars have been far less common this year than at any point between 2011 and late 2018. Broken down by city, Redfin reported that San Francisco, Boston, San Diego and Portland were the most competitive housing markets during the first weeks of March 2019. Miami, Dallas and Houston were the least competitive markets. Competition for homes serves as a barometer for the housing market, meaning that fewer bidding wars supports various experts’ observation that conditions have cooled significantly of late. 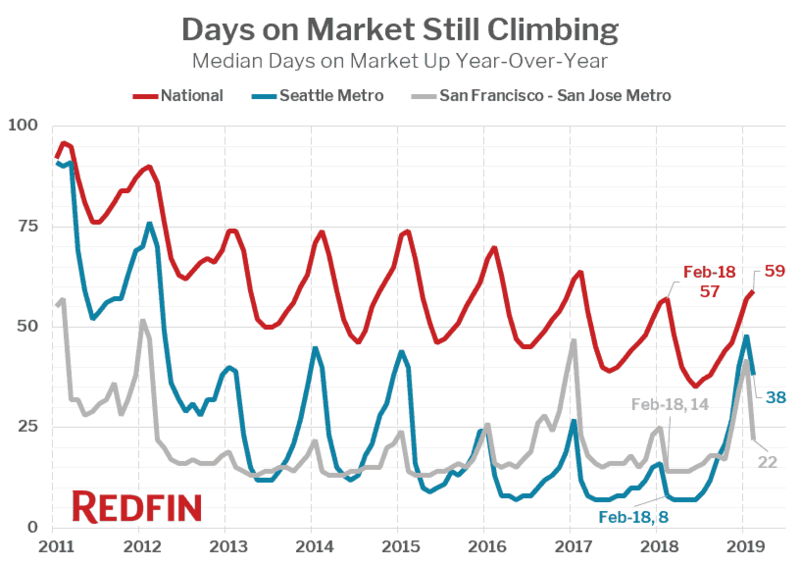 The amount of time houses remain for sale also supports that thesis; Redfin’s report shows that days on market actually ticked up in February, which is rare. Analyst have been noting for months that the housing market has slowed considerably, pointing to factors such as fewer flipped homes, slowing price appreciation and of course declining sales. Rising interest rates at the end of 2018 also apparently helped tamp down demand, though more recently the Federal Reserve has halted rate hikes and indicated no more would be coming in 2019. Redfin’s report largely bears out the idea that the market has slowed. However, it also concludes that 2019 could ultimately see conditions heat back up, with bidding wars serving as a useful metric.